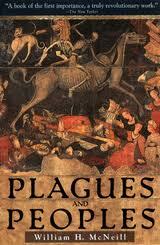 Maximizing Progress: Plagues & Peoples ~ McNeill's Epidemiologic! macroparasitism of large-bodied predators, chief among which have been other human beings. Microparasites are tiny organisms -- viruses, bacteria, or multi-celled creatures as the case may be -- that find a source of food in human tissues suitable for sustaining their own vital processes. [There's lots of variety.] Macroparasites exhibit similar diversity. Some kill at once, as lions or wolves must do when feeding on human or any other kind of flesh; others allow the host to survive indefinitely. [...] Simple cause-and-effect analysis is inadequate for such systems. [...] But the conceptual and practical difficulties here are enormous." That's what McNeill tackles, so read the rest! Highly recommended.